Decision Coaching 2.0: Where do scenarios fit? Stories that can help us recognize and adapt to changing aspects of our present environment. They form a method for articulating the different pathways that might exist for you tomorrow, and finding your appropriate movements down each of those possible paths. Scenarios were a very popular part of the strategic planning narrative for many years. Over time, executives have realized that they are only part of the story unless they are linked to decision making. From the perspective of the Collaborative Design Process (See slide on the left,) scenario thinking is part of framing. 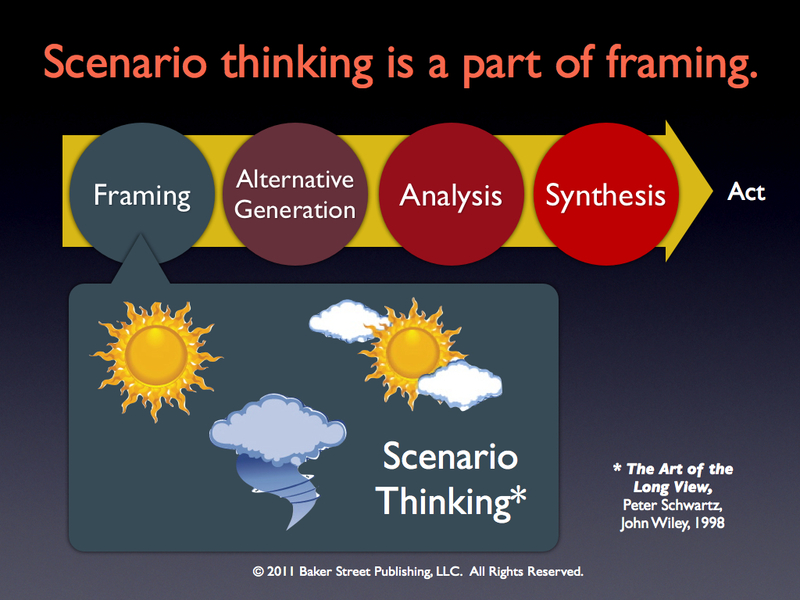 Scenario thinking helps us understand the world we are doing business in and the range of futures we need to consider. Simply put, scenario thinking helps us get out of our boxes. Framing is the first phase of the Collaborative Design Process. 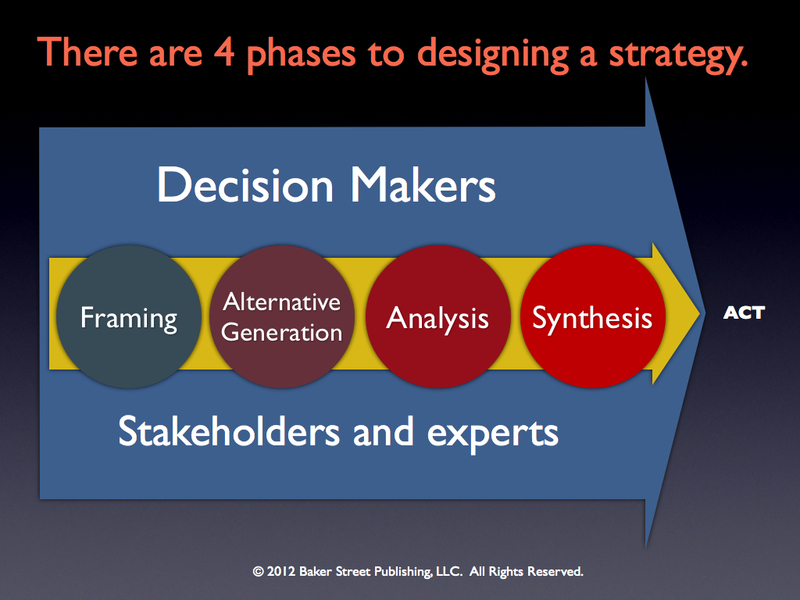 The process has 3 more phases: alternative generation, analysis, and synthesis. In many ways framing is the most important phase. Inappropriate framing is the root cause of most bad decisions. Perhaps Hewlett Packard is in such a mess today because they didn’t do enough scenario thinking. Or maybe they did do the scenario thinking but they didn’t do the alternative generation, analysis, and synthesis. Now they are a PC and printer manufacturer wishing they were a smart phone and iPad manufacturer. They are trying to acquire their way into markets they could have dominated, markets like web search and professional services. Thinking about alternative futures is imperative. When we do we start looking for hedging strategies. Hedging helps avert disasters no matter how the future unfolds. The Collaborative Design Process and the tools that go along with the process are the result of 40 years of decision consulting and coaching. It has its roots in the work of many organizations: the Management Science and Engineering Department at Stanford University, SRI International, Strategic Decisions Group (SDG), SmartOrg, Decision Focus Incorporated (DFI), Applied Decision Analysis (ADA), Chevron, Boeing, General Motors, and many others.